This never-worn (except for these pictures) dress was originally purchased at Macy's. It's by Alyn Paige New York and was made in the USA. 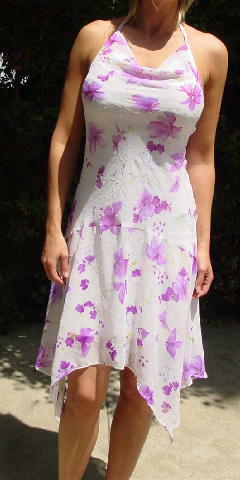 The see-through dress and the white lining are both 100% polyester. The lining has some stretch to it. There is a halter neckline with two 24" long ties. The hemline has a scarf effect and the fabric has an elevated krinkle freeform line design. 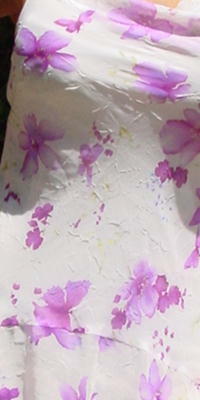 It has a design pattern of multi-tone purple flowers with green leaves with yellow flowers and periodic acccents of light violet. Above the front top of the lining is 4 inches of doubled fabric, which gives a nice draped effect. The tag says size 7/8, but it fits more like a 4/6. A partial store tag is still attached. A South American model bought two in different sizes to wear to a wedding and reception. She didn't have time to try them on. armpit to bottom side 34 1/2"
armpit to slip bottom side 27"